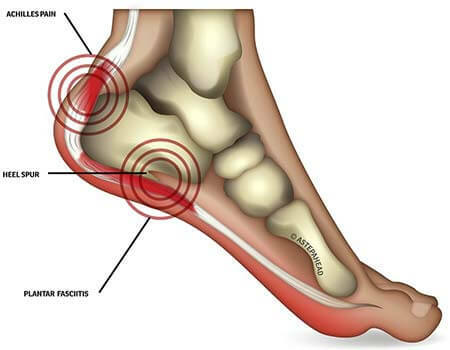 Sports Injury & Brooklyn Pain Management clinic is one of the first practices in New York to offer Platelet Rich Plasma (PRP) Injections for patients suffering with heel pain. Our facility equipped with the most advanced, cutting edge equipment to treat heel pain. Just like the name suggests, heel pain is an intense pain that the individual experiences whenever they use one or both of the affected heels. Heel pain is the most common problem that affects the ankle and foot, and that is because of the immense pressure placed on the foot at any given time. More than 50 tons of stress is exerted on the foot in every kilometer you walk, and this stress is amplified when carrying heavy loads and running. For these reasons, heel pain is quite common. Rarely, it is a serious medical condition. However, it can interfere with daily physical activities and particularly with exercises. Heel pain develops when the plantar fascia becomes damaged. The foot is not flat, but it has a slight curve from the bottom of the heel to the sole of the foot where the phalanges of the toes begin. Maintaining this arch on the foot is a band of muscle called the plantar fascia, which is tough but flexible. The function of this muscle is to maintain the flexibility of the arch and act as a shock absorber when walking. Just like other muscles, though, the plantar fascia can also become damaged, and the foot loses its flexibility and shock-absorbing properties. In addition, the damage to this essential muscle causes pain, particularly on the bottom and back of the heel. Stepping on a stone or another hard object directly with the bottom of your foot. Heel spurs develop when the lining that covers the heel is in a continuous stretching. Over the time, pieces of the lining can break off. Achilles tendinitis is an inflammation of the Achille tendons. This medical condition is common among runners, joggers, professional dancers, professional athletes, etc. Plantar fasciitis is an inflammation of the plantar fascia, a thick band of tissue which runs along the end of your foot. It is more common among joggers and runners, but it can also occur due to wearing shoes that do not fit correctly. The diagnosis is usually done through a physical examination where the doctor checks for any swelling and feels around the foot to check for the points of tenderness. Usually, heel pain goes away, on its own after some time, but there are a number of interventions that can be made if the pain is extreme. NSAIDs are non-steroidal anti-inflammatory drugs that help to reduce the pain and swelling. This is not always necessary, though, and resting the affected heel is usually the solution along with cold compression. To help in the recovery, simple stretching exercise and light walks are also recommended to get the plantar fascia healing faster. Shoe inserts are also advised to help prevent further damage of this muscle. How to prevent heel pain? Even though heel pain is not a serious medical condition it can interfere with daily activities. Here are some tips how to prevent heel pain. Maintain a healthy weight. If you are obese, lose some weight. Stretch your muscles before any physical activity or exercise. Wear comfortable and well – fitting shoes with proper feet support. Wear the right type of shoes when running, jogging or performing any physical activity. Take a rest if you feel tired or when your muscles start to hurt. The goal of our specialists is to diagnose your problem, define a personal treatment plan based on your condition and get you back on the track with minimal downtime. Conservative treatment is suggested first. However, in severe cases when conservative treatment does not solve your problem and relieve your heel pain, surgical treatment might be needed. The most advanced pain management center, Brooklyn pain management doctors and specialists at Pain Physicians NY offer unique, individualized approach to manage your heel pain. We are using the most effective pain management options including Platelet Rich Plasma (PRP) and Corticosteroid Injections and utilizing the latest technologies available in USA.